Size 8 Asos tea dress up for grabs. Its a pretty Maroon colour. 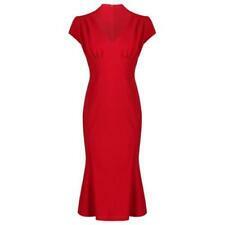 Lovely 50 60 dress red with black spots worn only once. Condition is Used. Dispatched with Royal Mail 2nd Class. Warehouse burgundy panelled shift dress with CB keyhole zip detail. 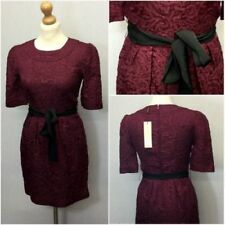 Dress has a shallow scoop neckline & is constructed of panels in 2 different burgundy stretch fabrics(centre panels & sleeve fabric has a more defined texture, whilst neck & side panels a more subtle texture). No give in fabric. Feature keyhole at back of neck. Short sleeves with tie. Length nape to hem 45" approx. ASOS TALL STUNNING KIMONO-SLEEVE, RED MAXI DRESS. SUIT LONG TALL SALLY. Where the item has been worn it is freshly laundered prior to dispatch. LOVELY RED FLOATY FABRIC FULLY LINED. 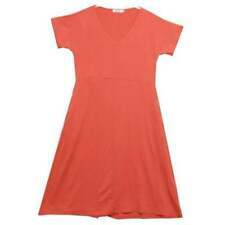 FLATTERING SKATER SHAPE WITH KEYHOLE DETAIL AT THE NECKLINE AND BUTTON DETAIL ON THE SHORT SLEEVES. LENGTH APPROX 36". Oliver bonds size 8 animal heart print orange pink key hole quirky. its more of a red coral colour. Sold out at Hot Topic. Model is wearing size small in picture. 33" from shoulder to hem. Size M (as stated on label) very stretchy. 100% Sale to Age Concern Charity. ♥Grab yourself a bargain! The Length of the Dress is 109cm. This Dress Features High Neckline. With Lace Detail and a Keyhole Back. With A Zip at the Back and also a Buttoned Neck. Ted Baker 'Caree' Sheer Lace Overlay Dress BNWT. Features delicate floral lace overlay, ultra-flattering sweetheart neckline, princess seams, fit-and-flare shape with full swishy skirt, crinoline underlayer for added fullness, short cap sleeves, grosgrain ribbon trim, single sparkly crystal button fastening at back, silky lining, and concealed zip fastening at back. Casual dress by Lavand. Machine wash. Loose fit – falls loosely over the body. Our model wears a UK S/ EU S/ US XS and is 168cm/5'6” tall. SIZE & FIT. This is a beautiful dress and of good quality fabric. Sits on the knee, but gives room to walk in with a short split at back. It really is lovely on, and so easy to wear. 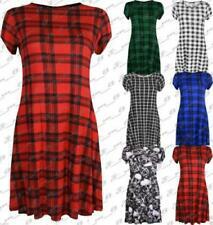 A really cute retro ditsy dress. UK 10 - 12. UK 12 in label. EU 38 - 40. Shoulders ~ 14". This piece is SUPER CUTE! Zip back fastening. Originally sold for £77.00 but now priced for a quick sale. A stunning slim-fit evening dress by French Connection. Super soft-touch jersey. Material 83% Viscose, 17% Polyester. Round neckline. Finished in bodycon close to body cut. Bodycon, it cascades over your curves to show off your stunning silhouette, while the mini length promises not to let your toned and tanned pins go unnoticed. The gorgeous crochet lace appliqué and inserts are balanced out with the classy sweetheart neck cut. Dart pleat down the front skirt. Length (shoulder to hem) 32". Length (waist to hem) 18". Stretch material.